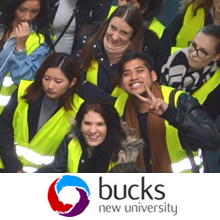 The students and staff (49 people) of Bucks New University in England (with 2 campuses near London) took a winter tour around Hahn Airport on the 23rd of February 2016. The students (studying Airline and Airport Management) stopped at VG Cargo to get a look at some of the interesting aspects of the cargo business. Three staff members at VG Cargo welcomed the visitors who arrived at 11AM. “It is always a special occasion to walk through our cargo terminals with – first time – visitors.” Michael K. Taweel, CD at VG Cargo GmbH. The visitors asked questions about the health and welfare of animals during their stay inside the cargo terminal. What the challenges are when dealing with dangerous goods, including questions about safety and security were also asked and answered. The Air Way Bills and HAWBs in addition to labeling and designation of general cargo rounded out the discussions between VG Cargo staff (V. Jakobi and T. Leoni) and the future aviation professionals. Special freight requiring extra careful handling including the special locations within the cargo terminal for example mail, currency, prototypes and temperature sensitive freight were also of interest to the up and coming aviation professionals. Before the tour was finished the prospects of finding a good job were asked about, like the diversity of professions and the various types of qualifications for some of the more technical positions. One thing that became very obvious during the tour was that this group of visitors is just as excited about cargo as we are!